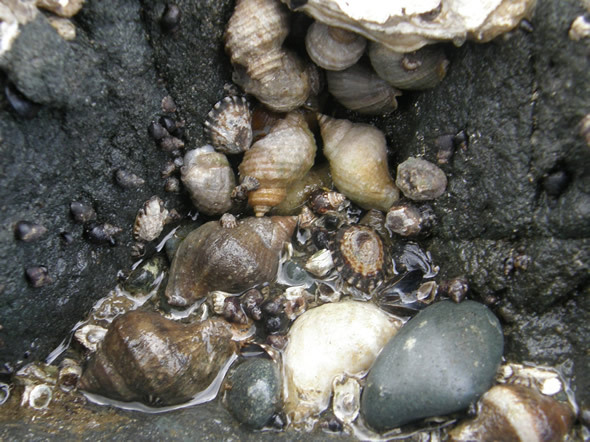 As the tide receeds, many of the cracks and crevices in the rocks and tidal pools of the seashore reveal a multitude of nature's weird and wonderful creatures. Welcome to the summer issue of Whispers, the newsletter of the Dereila Nature Inn - your cyber nature centre. Many thanks to all of our subscribers for supporting our nature project! We hope this issue finds you well and enjoying nature wherever you may be. 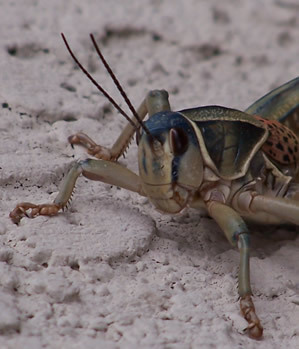 Which critter of the woodlands floats when it goes into water? Here's this issue's little nature puzzle. 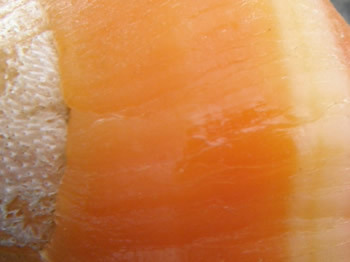 What do you think this close-up image is? 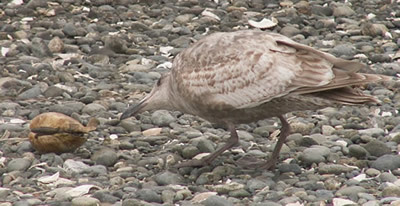 We have also added many new images to our At-A-Glance Guide to Marine Life. 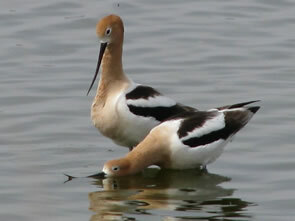 Dr Ron Walker of Victoria, BC, our frequent contributor of underwater images submitted these two pictures of American Avocets taken during a springtime trip to Saskatchewan. 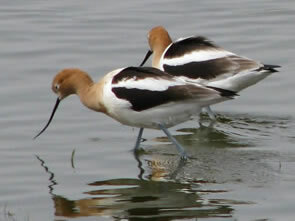 Coincidently the Avocet was last month's bird of the month. 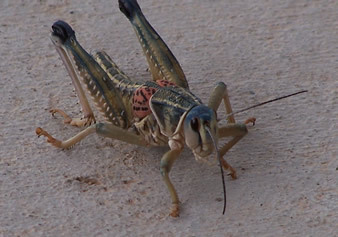 W.C. Durnil of Arizona also submitted these two fascinating pictures highlighting the amazing colours and features of the Morman Cricket. Thank-you so much for sending in your pictures! This month our wandering image is taken close to the ground. 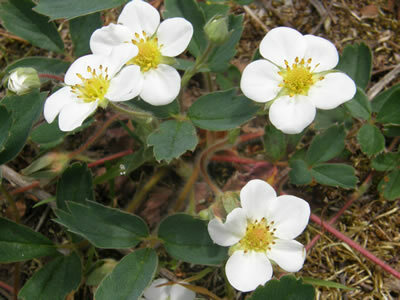 The common wild strawberry, Fragaria virginiana, is responsible for practically all of the cultivated strawberries grown today. It grows in well-drained open areas where it is able to send out its reddish runners. Here it is shown in flower which usually occurs in late spring or early summer, depending on the location. During the summer months, tiny but familiar looking strawberries appear. We visit Red Rock Canyon located in Waterton National Park in Alberta this month. 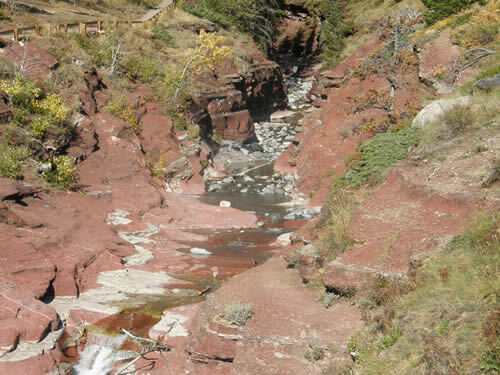 Waterton is perhaps more famous for its mountain scenery and diversity of wildflowers, but this fascinating canyon of vivid red rock is a favourite spot for visitors to explore. Your can take the Inn's virtual visit to Waterton by clicking here. Once again we have selected an image that is waiting for a funny caption. As usual we've given you a couple of ideas, but we await your insightful, witty suggestions. Number one: "Yoo hoo! Anybody in there?" Number two: "You can come out now! Trust me, the tide is in." If you have any suggestions for additional funny captions, please, send us an e-mail! We'd love to hear from you and add your caption to our collection. Subalpine Fleabane, Erigeron peregrinus, is an alpine or subalpine member of the aster family. 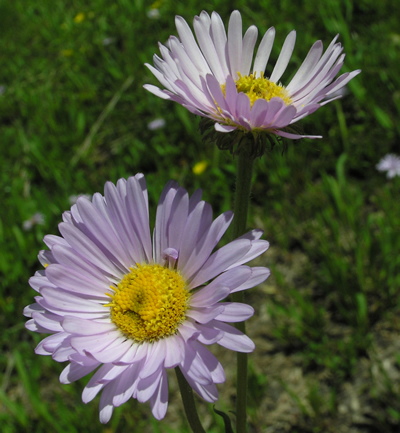 It's scientific name Erigeron is from the Greek language, eri meaning early and geron meaning old man. This is in reference to the appearance of the white hairs of the plant's fruit so soon after flowering. Peregrinus, means "traveller." 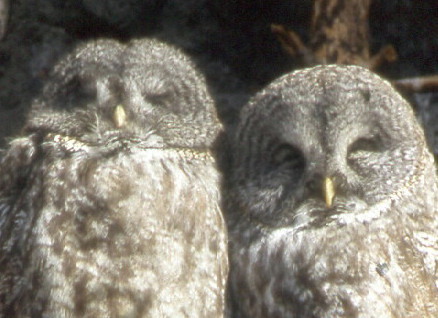 Two owls are sitting having a beer in a pub. One turns to the other and says, "By the way, I got married last week." The second one says, "You twit! To who?" As you can see, these two can't control their laughter at that hilarious joke! 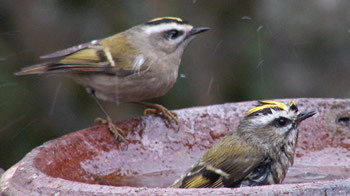 A bird bath should not exceed 2 and 1/2 inches of water. Different sizes of baths with shallower depths will encourage more species to visit. 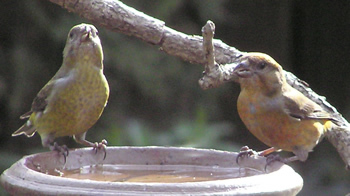 Smaller dishes are also convenient as birds' drinking water. For the past six months we have been adding a new nature-themed photograph every week to the Inn which means we have posted over two dozen images featuring wildlife, scenery and flowers. Click on the collage below to see the entire selection. We'll be taking a bit of a summer break as we head out with our cameras during this exciting time of the year. Until next time, may your experiences in nature be wonderful. Have a terrific summer! See you in September. 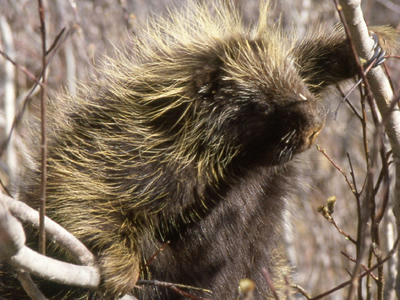 The Common Porcupine is able to easily float due to the design of its quills. Find out more about this amazing rodent by visiting our Walking in the Wild page. 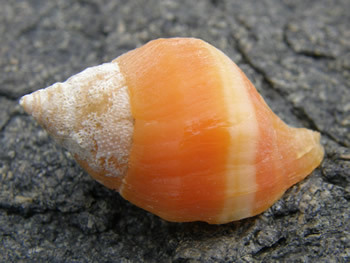 It is part of the colourful shell of the Wrinkled Amphissa, Amphissa columbiana. Hopefully you got that one right! Find out more about diverse marine life in our Marine Life At-A-Glance guide.